Have you found an online vendor selling Skipper Dark? This rum has a distinct molasses taste and packs a nice punch. The latest addition to the shelf for dark mixers. Skipper rum has a really nice deep dark red colour, and a pleasantly sweet (with a little alcohol) smell. This rum starts with a heavy molasses taste, followed by a sweet treacle flavour. Simple yet enjoyable. Unlike some dark Navy style rums, Skipper mixes easily with Cola or Ginger Beer, making for a nice light (er than expected) drink. Not a very strong aroma at all, very dark color which is nice, flavor is very light but has a burn and not so nice aftertaste. Might be a better mixer than a sipping rum. 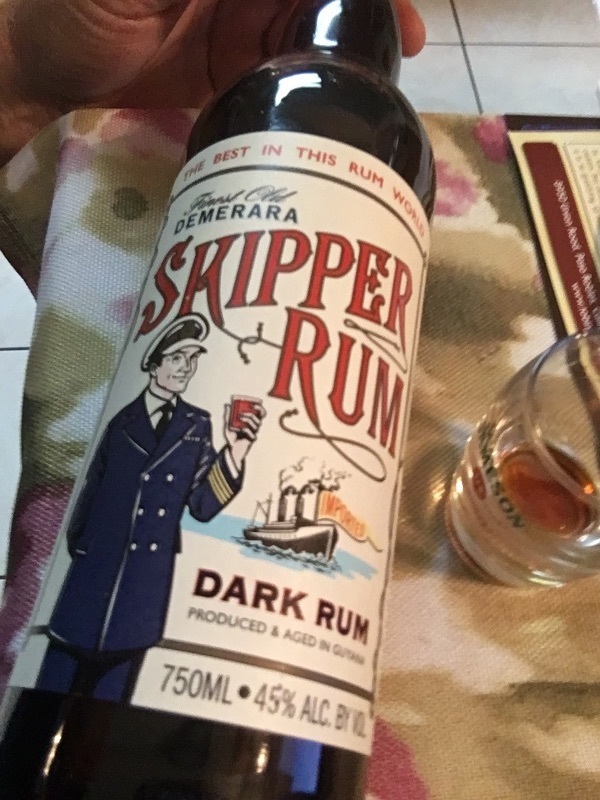 Enjoyed a bottle of Skipper Dark Rum while in London. Low end bottle and label design. Super dark brown color so plenty of artificial additives for sure. Vanilla, caramel, molasses and alcohol straight to your nose and palate. Long and nasty burn at the end. This is a mixer rum by all counts. This rum was not bad, but had a very weird aftertaste. I would mix this rum, not so great to sip. 40% ABV (there is a 45% version in the US). Nice warm nose. Lots of caramel and vanilla. Tastes exactly how you might expect. Rich, with that chocolate chip cookie dough character. Slightly bitter finish (molasses?). Easy drinking. Would make for a great mixer. Sampled this rum during a tasting seminar at Cardiff Rum Festival. It's a dark rum from Guyana. The bottle still bears the original label from its launch back in the 1930s! It's a good mixer for its price and I almost certainly would not have come across this had it not been for the seminar I attended. Skipper rum has a really nice deep dark red colour, and a pleasantly sweet (with a little alcohol) smell. This rum starts with a heavy molasses taste, followed by a sweet treacle flavour. The nose is great, the aftertaste is really nice, but the taste itself is a bit bland. This is not a rum to have on its own, but it's powerful enough to come through with a molasses flavor when mixed with anything. A recommendable mixer but not a recommended rum. Not as 'rich' as Wood's, but certainly smoother, and tastier making it one of the best dark/navy style rums out there. Mixes well in the common favourites like cola, dark n stormy, grog, lemonade etc, and isn't too bad straight either. I would agree with the 'lack of complexity', but rum is rum and this is a dark rum and this is how dark rums should taste. I must have something to collect, so here is another fine rum. A mix of 7 rums a minimum of at least 3 years old and then shipped to Bonnie Scotland for blending and bottling. Nose , lovely strong brown sugar smell , smooth but quite hot in the mouth , quite pleasant as not an alcohol burn.Long , long finish , real Navy type rum.Only tried straight but would go great with ginger beer.This would warm the balls of a brass monkey !! Was recommended this after expressing an interest in dark rums. It's great in dark and stormys and with coke. 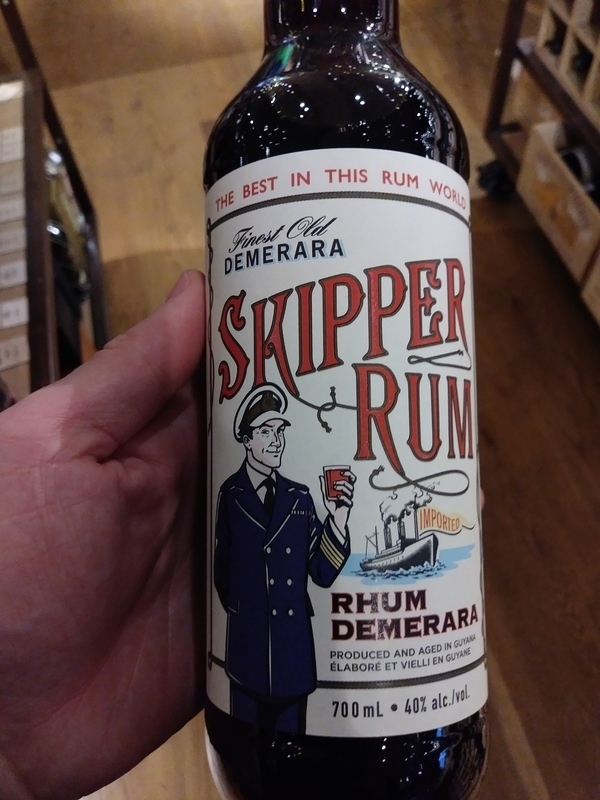 Wasn't expecting much as I'd never heard of it prior to spotting it in a rum festival but I was pleasantly surprised by a fairly smooth and very rich demerara rum. Nothing special in terms of flavour and complexity but a solid dark rum. Feel: Very smooth. Surprisingly sippable. Long finish. Taste: Familiar Demerara taste. Quite woody with a hint of spice notably black pepper. I was waiting for my local to get more Lemon Hart 80 proof in because I was getting low and to my surprise another Demerara showed up. Normally this kind of rum is reserved for cocktails or on the rocks however I find this to be very sippable neat. I wouldn't say it is a replacement to LH - which is 10 bucks cheaper and works better in cocktails - however I think can sit on the shelf quite comfortably next to it. Nice dark rum,ok for sipping but I prefer with coke. great colour, very smooth for a navy rum and easy to drink. Quite a statement i know, but as im not the biggest fan of dark rum and trying this was an absoulte pleasure of a suprise, im going to stick to it! Really nice heavy mollases content gives you a great taste of caramel, almost treacle actually aswell as a light oak finsh creeping through... Would happily drink this with coke but even happier with on top of my Zombie!